Apparently I have a thing for vintage record player cabinets. 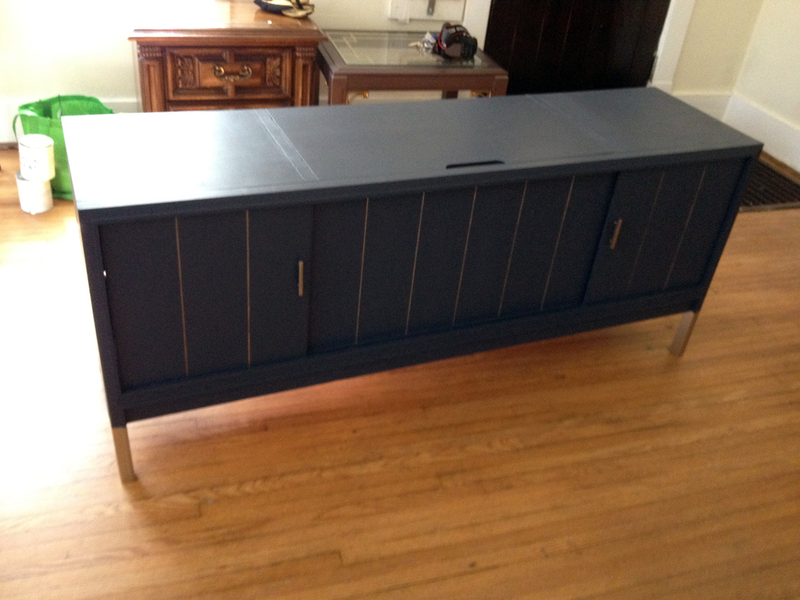 This is my second record cabinet makeover in recent days (see the first), and I am as much in love with this one as the last. 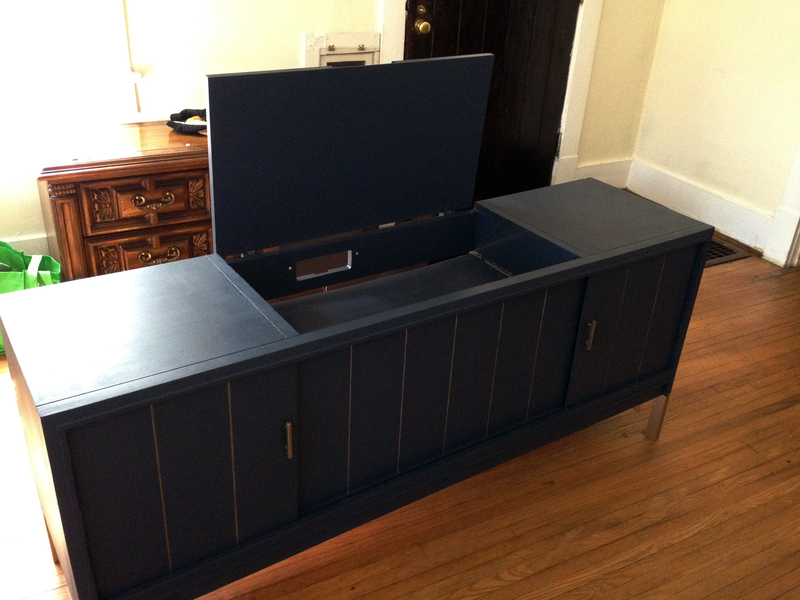 I found this Mid Century style record console that had been gutted on Craigslist and picked it up immediately. So, I busted out the DL hand cleaner (aka the best furniture cleaner in existence) and spent a solid two hours scrubbing and sanding. I have found that when I am planning to paint a piece, I will typically use the DL and then spend as much time sanding, first with 120-grit to really get the finish off, then with 320 to smooth the edges. Wow that is so fantastic!!! Reblogged this on Goodwill Hoarding. That really turned out beautifully! Awesome job, you inspired me for a piece I have. Awesome! Send me a link to an after photo when you finish it! 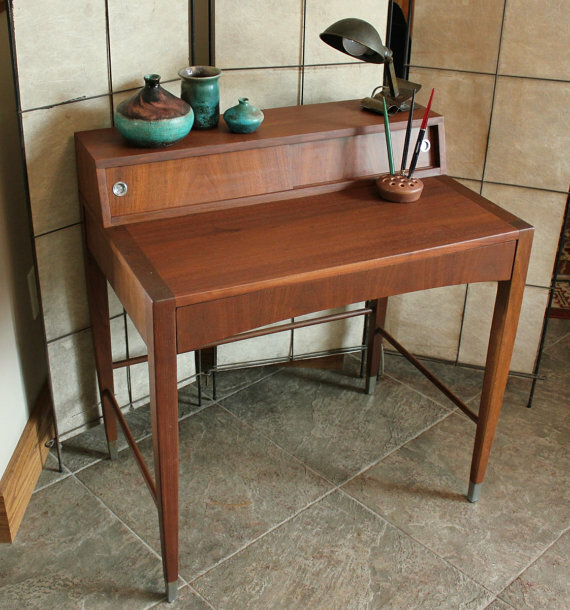 That is a great transformation… It makes me think I need to keep my eyes out for a similar piece and make a buffet or sofa table out of it. Love that blue-gray color too, beautiful choice. Thank you so much! Lately, I have been a bit obsessed with that color, myself. hey, so i have a question. are you using this with modern speakers? or with the insides taken out? 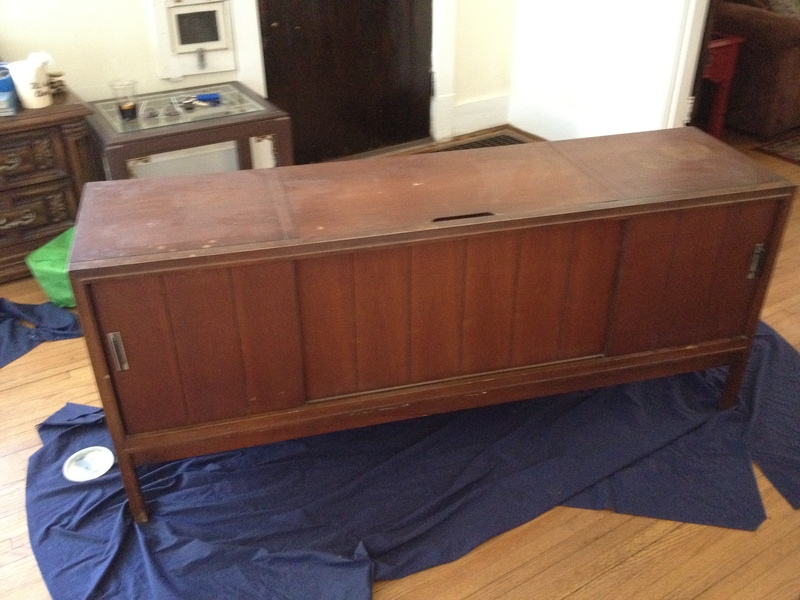 I’ve been thinking of finding some old stereo cabinet and making it into a flatscreen tv stand. However, the ones i’ve seen at the thrift stores are full of stereo innards (how do i remove them? ), and they often have tops that seem like they may not support the weight of a television. If you’ve done anything to change the structure of the piece, could you share? This one already had all of the speakers and record player components taken out. 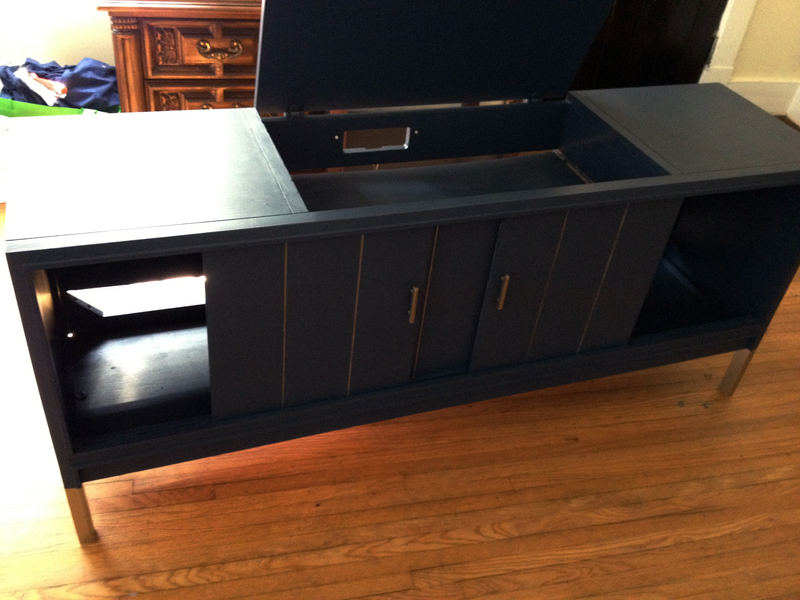 You can usually remove the speakers and record player fairly easily using a screwdriver. 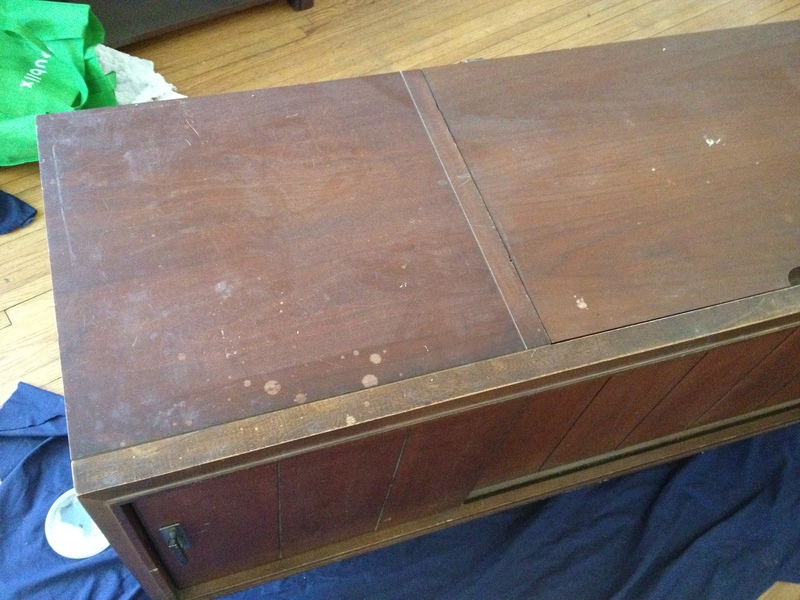 Once you remove the back of the console, it should be pretty easy to get everything out. Good luck! Dropping by from Apartment Therapy. 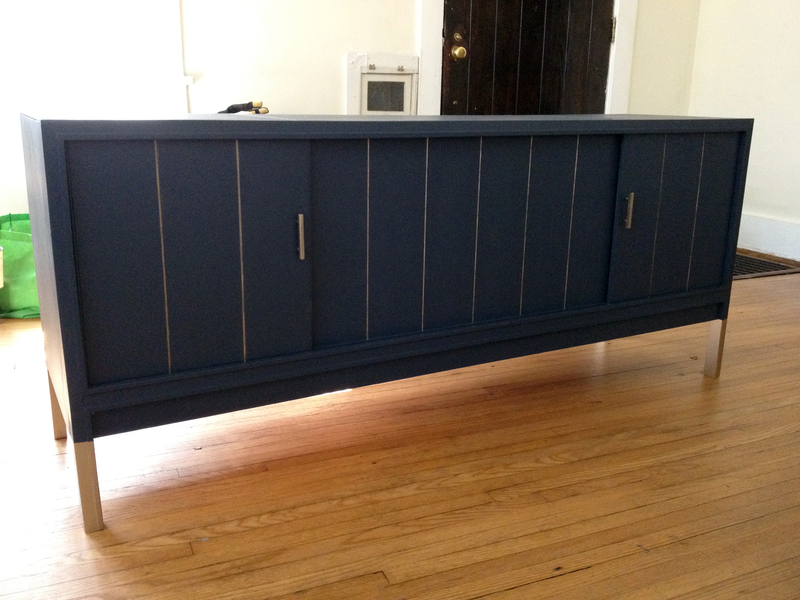 Love what you did to this cabinet. Who knew it was possible to make such a beautiful, drastic change on a piece with stark beginnings. Well done! Thanks so much!! I appreciate the kinds words!